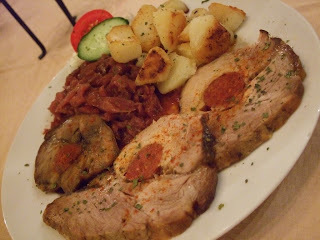 We established early on that this was going to be a meatlovers' tour of Europe. In some of the towns we travelled to it was just as well: in Sanabria in Spain, for example, most menus offered a choice of how your beef was cooked, and not much more. 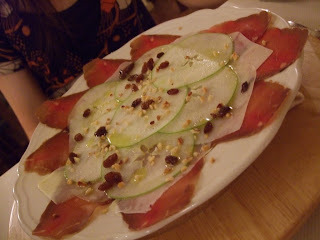 More than fillets and steak, however, what really stood out were the cured meats. 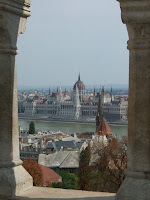 Our trip itinerary read: Budapest, northern Italy (including Emilia-Romagna), north-western Spain. Looking at those three destinations, three things that immediately come to mind are: salami, prosciutto and jamon. On the proscuitto front, we were in for a real treat. Other than a dogleg as you near the coast, Ravenna lies in a straight line on the far side of Emilia-Romagna from Parma - home to one of the finest cuts of Italian ham. We stayed at Hotel Centrale Byron, where their 5 euro breakfast featured some of the best crudo we ate on the trip. 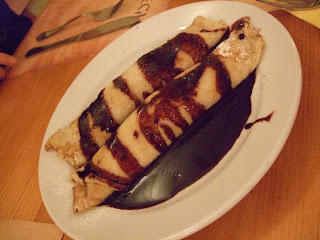 That's what is so gorgeous about travelling and eating in Europe. Locavorism isn't an 'ism' over there, it's just the obvious way to do things. 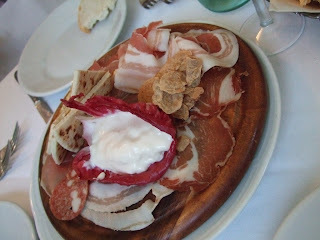 We tried two meat platters around the restaurants of Ravenna, one so divine we went back for it again. 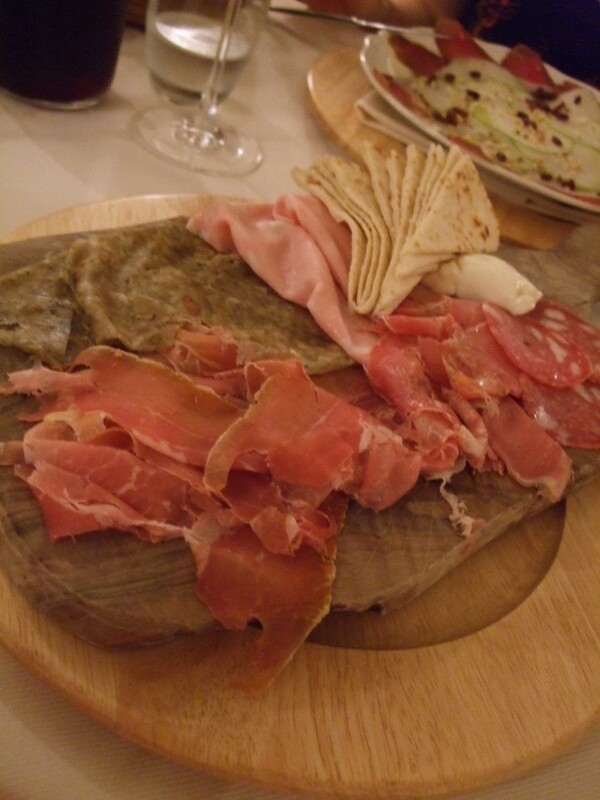 Here's Nonna Ayeska's: Proscuitto crudo in the foreground, then (going clockwise) coppa di testa (head cheese), mortadella, piadina, squacquerone, salumi, ciccioli a fette. On the second night, the dish became - implausibly - even better with the addition of some onion jam. Nonna Ayeska also served up this extraordinary plate of bresaola (for a starter!) The decadent meat slices are topped by equally thin strips of parmagiano and green apple, then dribbled with sultanas and nuts. Just astonishing. At La Gardela their plate of tagliare buongustao (local cut meats) was differentiated from Ayeska's with the more traditional style ciccioli frolli. Ciccioli is made from leftover pieces of pork, and the frolli style is crunchy, like the ultimate version of pork crackling. Piadina is the local bread in Ravenna, and perhaps the best value lunch I had while overseas was from the piadineria across the road from our hotel: a fold of the thick, flat, chewy bread clamped around proscuitto crudo and provolone, for 3 euros. 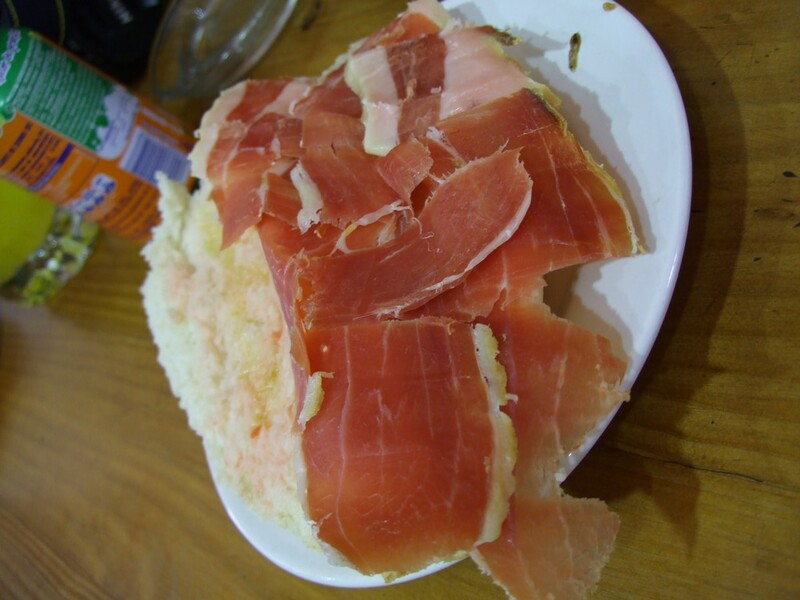 Once we got to Spain, I could have subsisted for the week on my all-time favourite food: fresh Spanish bread laden with jamon serrano. 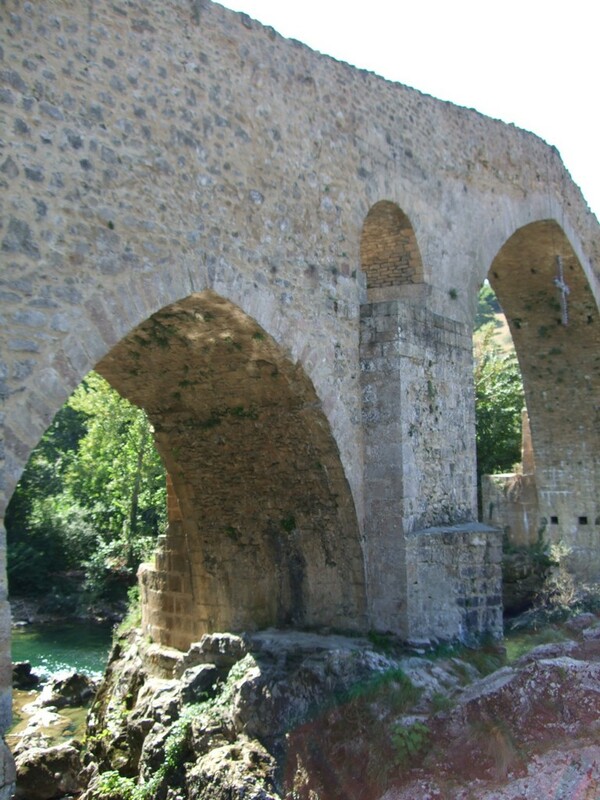 The best cured meat sandwich came from a still-warm breadstick bought in the northern fishing village of Cudillero, filled with serrano bought from a deli in Oviedo, and eaten by a stream gurgling towards the Picos de Europas, in the shadow of this medieval bridge. 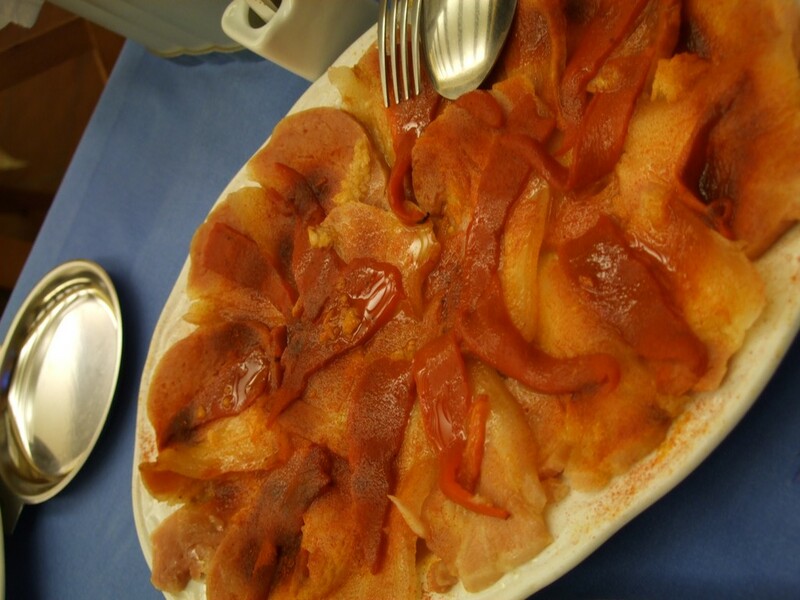 In Sanabria, while I moaned over the greatest plate of morcilla ever served, SG was in similar raptures over an enormous serving of lacòn de cerdo con pimientos del piquillo - cured pork with red peppers. In homage to our regular enjoyment of the cured stuff while we were overseas, we've been pursuing the best purveyors of cured meats around Melbourne. For jamon, you can't go past Casa Iberica in Johnston St. For proscuitto, our current fave is the $60/kg import from the deli in Northcote Plaza. Note that most good delis stock imported and locally cured meats. Often the former are preservative free. 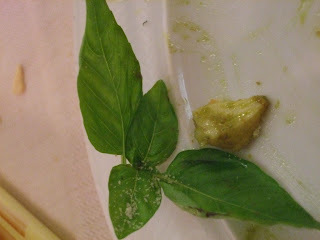 Our Italy trip was no more pasta laden than an average week of eating in Melbourne. 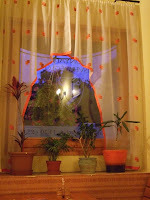 Our attention was far more diverted by cured meats and delicacies, both savoury and sweet, from street-side shops. Pasta undoubtedly deserves its own mention, however, particularly since it formed part of some very worthwhile dining experiences. 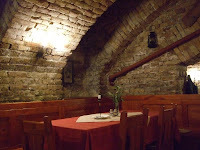 Ristorante Vecchio Falconiere in Padova looked like a great find. 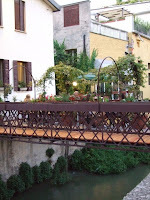 Accessed via a flowered bridge across a canal, it offered al fresco dining from a menu that promised reasonably priced pastas or, if we felt like going a little crazy, affordable, meaty mains. Call us staid, but we decided to stick with a la carte. We were rewarded for our lack of adventurous spirit, however. 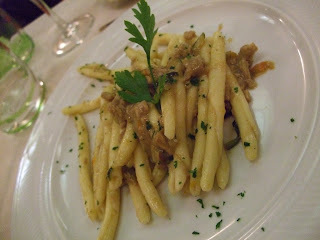 First up, the fusilli con cinghiale (wild boar, or wild pork as our host insisted). Fusilli in Australia, when bought as dried pasta, is normally shaped as a swirl. Freshly made, Italian fusilli, however, as you can see looks much more like someone took a length of pasta and rolled it over the table. Its curves were perfect for capturing the unctious ragu. 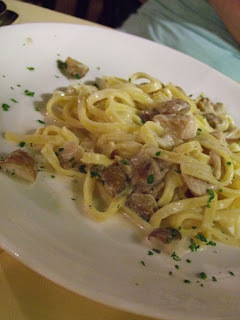 We also loved the tagliatelle con funghi misto, a dish of of rich, earthy variety. 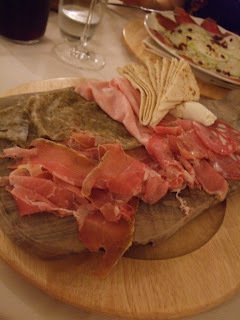 Our favourite restaurant discovery of the trip was Ristorante Nonna Ayeska in Ravenna, the main reasons for which will be elucidated in a coming post on cured meats. Their pasta was nothing to complain about either. 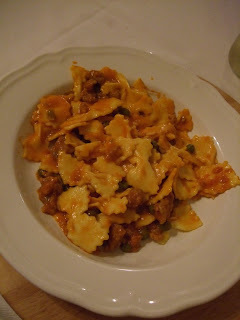 The restaurant specialised in the local style of filled pasta, cappelletti, or little hats. These came con ragu or, as below, con vellutata di carciofi. 'Vellutata' literally means velvety, and I think it's a wonderful term to apply to the mush of artichoke that clung to the cheese-filled pasta. A sauce of salsicce e piselli (sausage and peas), tried on different visits with both gnocchi and strichetti, was delicious, but lessened by the fact that the peas had been cooked in highly salted water, and that saltiness dominated the dish. 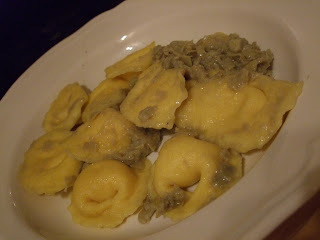 Strichetti is Emilia-Romagna's version of farfalle, and looks more like Chicken-in-a-Biscuit than bowties! 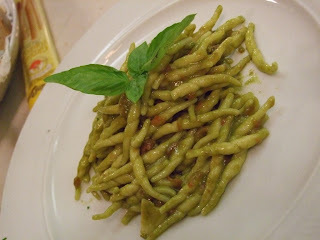 At Trattoria da Paccagnella in Padova we sampled some of the Veneto's favoured pastas. 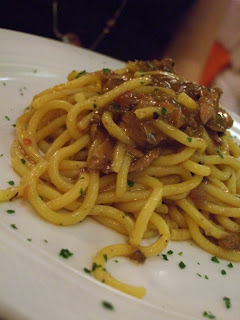 Most restaurants feature bigoli, a type of enlarged spaghetti, eaten here con sugo di gallina imbriaga, 'gallina' referring specifically to hen. The sugo, fittingly enough, tasted precisely like chicken soup. Ragu di vitello in bianco e fiori di zucca (twisted pasta in veal and white wine sauce with zucchini flowers). At Paccagnella, house wine comes to the table in a bottle, and diners pay for a quarter, half or full bottle depending on how much they've drunk. I love Brunswick. I love its range of food stores, unpretensiously provisioning cravings for any number of cuisines from around the Mediterranean. I love its capacity to support cafe after cafe. Before long, the ratio of foodstores and cafes to houses in Brunswick will be 1:1. I love the way its locals will drive, ride or walk past any new outlet with faces of intrigue, their intention to come back and check it out writ large. 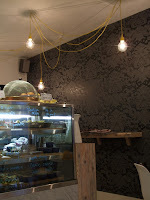 Va Piano is the latest to add its food and coffee mix to the milieu. Perched at the top end of Nicholson, across from the Lomond, they look like they've been there forever, and by their fourth day of operation locals came to sit in with papers and take away coffees like they'd been coming there for years. While their kitout is far from flashy, the wood on display is bespoke, rather than reclaimed. The cafe's name, cut out from the wooden front of the requisite window bench table (where better to watch the ogling Brunswickers? ), sits jauntily on a shelf at the rear of its compact space. Thankfully they haven't gone fancy with the crockery; Melbourne's stock of cute and kitsch plastic and crockery has been further depleted. 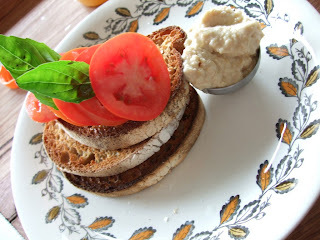 It's put back into use at Va Piano to serve sourdough toast with a handful of toppings (that's tomato and hommous, below), fruit toast or baked eggs. The range of filled sandwiches in the counter display look particularly appealing, and muffins and croissants are also on offer. Hardware Societe could not be less disturbing. It's delightfully fitted out with glass and faux marble counters, muted flocked wallpaper, oversized bare bulbs and bright cabling drooping from the ceiling. 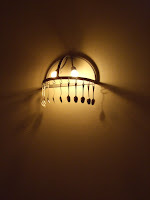 It suits the chi-chi clientele dropping in from the west-end business sector, but it's just as big a drawcard to anyone hankering after superb produce cooked with skill and a firm nod to French and Spanish influences. The menu barely misses a beat through breakfast and lunch options (except for unforgivably misspelling jamon throughout). Breakfast dishes include arroz con leche; miniature, indulgent raspberry doughnuts; or a slice of brioche from a gorgeous high-tea set. The only certainty when ordering at lunch is that you'll have to come back to try whatever you don't choose. 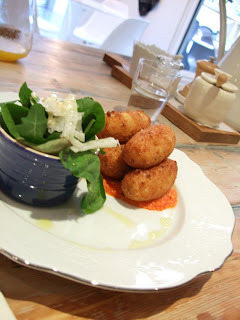 Cod croquetas are crisp and creamy in a puddle of tomato sugo. The aforementioned jamon, from Casa Iberica, is perfectly wedded on a bocadillo with manchego and membrillo. Another bocadillo option of tortilla, pimientos and aioli is perfectly Iberian, whereas a gooey, moreish goat's cheese and chive souffle says 'oui' to Spain's northeast neighbours. 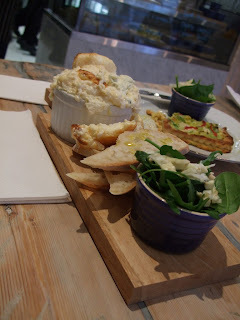 Other lunch options include charcuterie and tapas plates (the latter perfect for putting off choice and simply sampling some of everything) and a range of exquisite tarts. And then there's dessert. Daily-baked macaroons might be filled with lemon curd or white chocolate ganache, and the cafe's dual influences are respected with the offer of creme caramel or creme brulee. 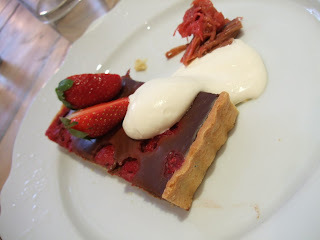 A chocolate raspberry tart provides a heavenly end to a deliciously satisfying meal, its ganache filling held in a pert pastry and hugging super-tart raspberries. 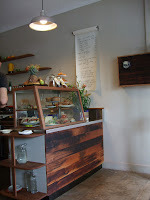 At the moment the cafe is open Monday to Friday, but Epicure reports they do want to open weekends from the New Year. Keep your fingers crossed. It's been all quite on the W&F front for a little while. Recently, that's because I've been in Europe, exploring Budapest; Ravenna and Padova in Italy; and the north-west of Spain. The trip was three weeks rife with culinary, artistic and visual delights, plenty of which will no doubt find their way up here in the weeks to come. Where to start? 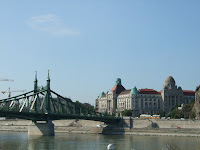 Well, the beginning's not a bad place, which takes us to Budapest. 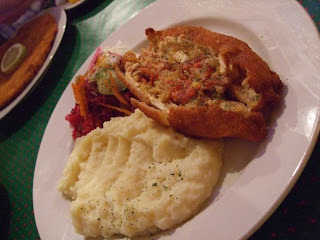 Hungarian food is big on pork, paprika, crumbing and stuffing. Their food is traditional enough that learning to recognise a few menu staples is a big help in the vendéglős (small restuarants). 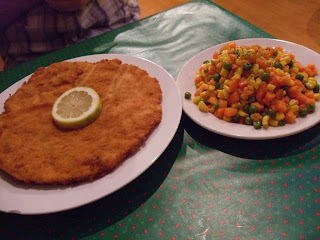 Rántott, for example, means deep-fried in breadcrumbs. Here we have a dish delightfully named 'postman's favourite', consisting of crumbed pork stuffed with sausage, onion and bacon (yes, that is three meats in one item). Pörkölt is a ragu of pork (normally), beef or chicken, coloured bright red by paprika. 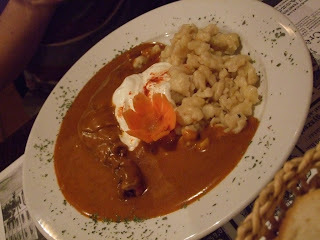 It's served here with noodles similar to the German spätzle. Paprika is a complicated word. It can refer to both a spice and a vegetable, the latter also being known as capsicum and pepper. In Hungary they cook a lot with what we call capsicum, often using a white variety, which to look at on the plate is indistinguishable from onion. They're keen enough on paprika the spice for it to be a standard condiment on most restaurant tables. 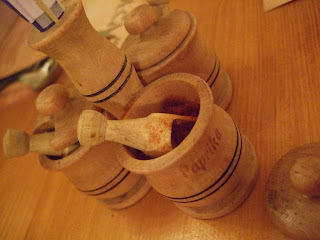 To add to the paprika confusion, paprikás in Hungary is similar to pörkölt, but sour cream is mixed into the sauce. 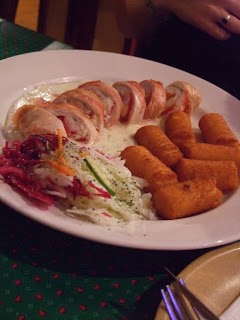 (Hungarians are keen on sour cream, but not as crazy for it as Estonians.) It's a meat-and-carb kind of place, since you need to mop up all that sauce with something. 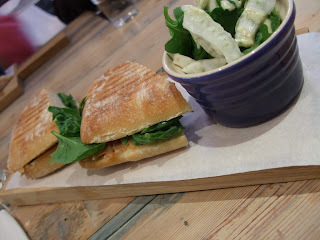 A side order of veg doesn't go astray either! 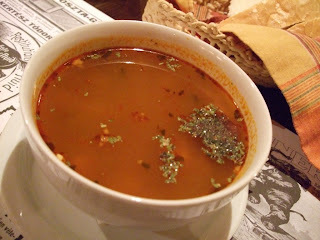 Gulyásleves (anglicised to goulash) presents another false friend: in Hungary it relates to beef soup (leves is Hungarian for soup), whereas we think of it as a stew (such as that served at Koliba). 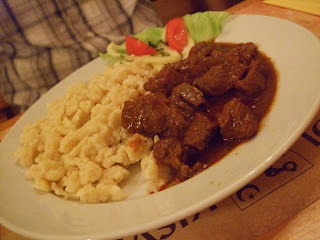 What we term goulash is closer to the pörkölt above. This soup was a little light on meat, but what meat it had was delicious. Conversely, it was quite strong on mint, which was a surprise.